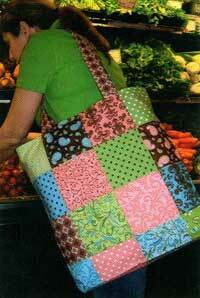 The Charm Street Market Tote pattern by Purse Strings is made with Charm Packs, which are 5" square pieces of fabric. This pattern is super simple to sew and makes up quickly. Finished size is 17 1/2" x 15 3/4" x 3".